Most clients tell me they believe the opposite of love is hate. Actually, the opposite of love is fear. 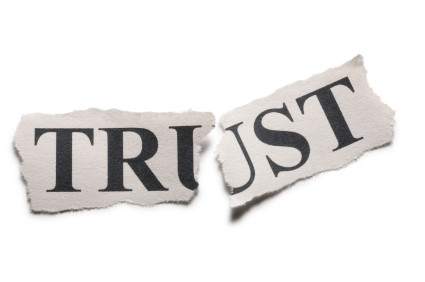 Broken trust is the center of most marital problems, regardless of where they came from. Trust can be broken overtly, as well as covertly. We break marital trusts without knowing them, because we enter marriage with expectations carried into the marriage from what we have seen of other’s marriages. Married couples step up to the alter usually unaware of what one partner expects of the other. We walk into a mine-field covered in a “pink cloud”. One of the hardest things to admit is that the stimulus of fear and anger is usually some form of infidelity. When someone uses the word “infidelity”, they usually mean a sexual encounter outside the marital bed. In truth, infidelity is simply a broken trust. Partners break marital trusts physically, but they more often break them financially, emotionally, and with dishonesty – perceived and also obvious, intentionally, and unintentionally. We trust each other to stick to a financial plan, but then spend un-agreed upon money without talking first. We trust each other to keep warm and flirty conversations inside the marriage, but then an old friend tags us on social media and we communicate in a questionable manner. We trust a partner to appreciate nice gestures, and they are taken for granted. Fights usually break out because of infidelities large and small. Before long, the “ether” of the wedding wears off, and we discover each other’s warts. The partner who excited us with creative impulses is now irritatingly unpredictable. The wanted feeling we celebrated as we tidy’d up for our partner, now has become a burdensome chore with a side order of ingratitude. 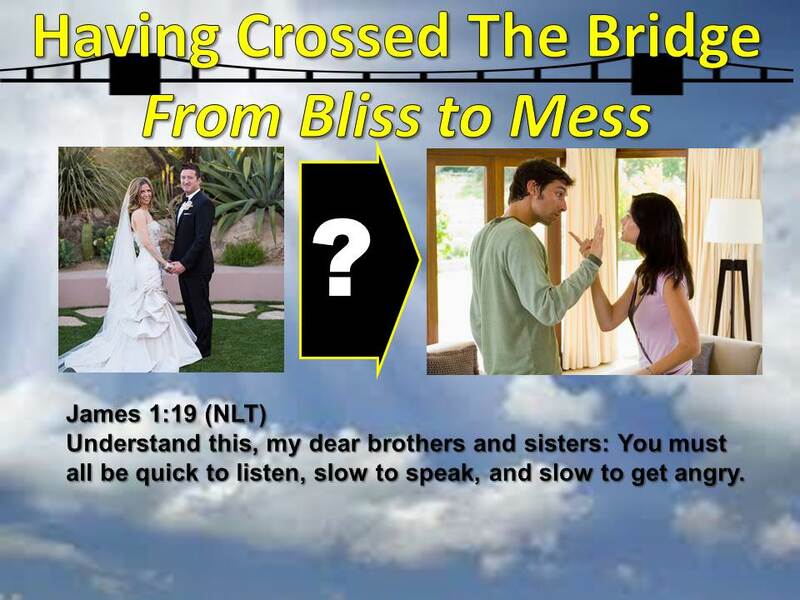 Expectations that should have been voiced before the wedding have become unspoken expectations and a mine-field marital problems waiting to explode. And explode they do. Very often, couples will have their first real fight due to any number sensitive topics. These active fights, if left unresolved, can turn into a Hot War. Wars are overwhelmingly unproductive. Infidelity is perceived and fear of being denied, deprived or unheard has squelched feelings of love. The emotional support and met-needs are exchanged for an atmosphere of injuring and force. Empathy and intimacy evaporate. Just as, if not more destructive, is a couple’s cooling to the point of a Cold War. Partners expect that they won’t be listened to, or won’t prevail in conflict, so they shut-down communication. 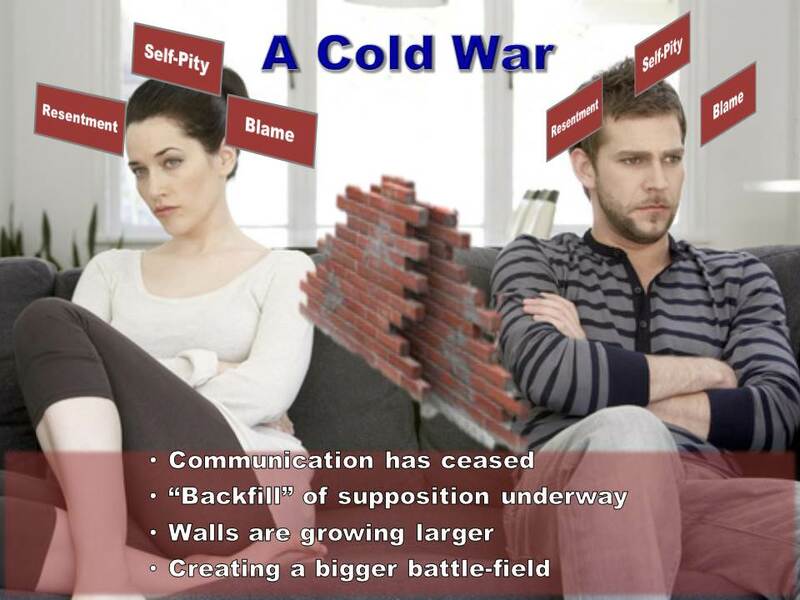 A wall starts to build, and the longer the wall stands, the more partners add blame, reasons for resentment and self-pity to stack more bricks in their wall. No one ever wins a cold war. What’s worse is that partners imagine what the other is thinking, and they suppose new and greater misdeeds to back-fill “dirt” against the freshly build wall. The longer cold war lasts, the higher the wall grows as well as the back-fill supports it. 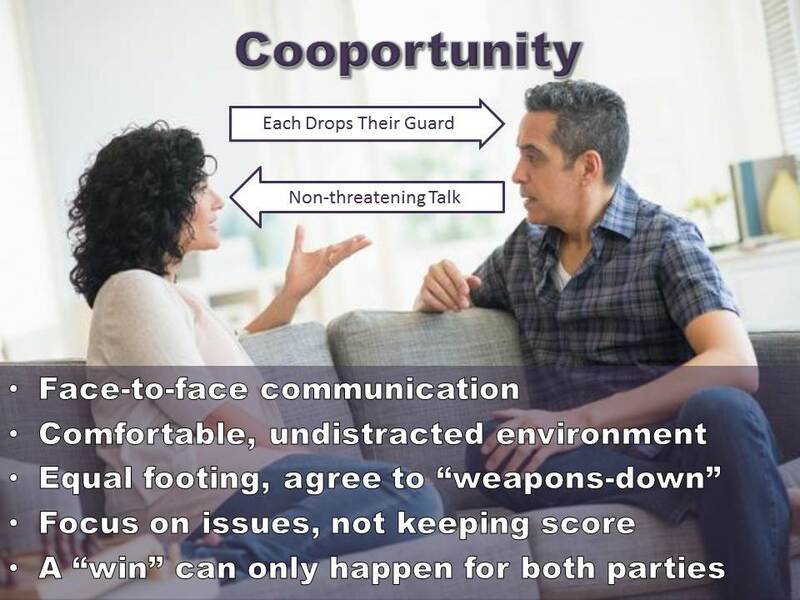 One of the most effective tools used to heal a marriage war is to schedule a “Cooportunity” – a time when you talk honestly and unemotionally about the issues of conflict. Putting pen to paper at this step is very useful and healthy to keep present conflicts from re-emerging later. Attitude is also extremely important. In a cooportunity, both partners agree to turn their battling energies toward the issues, rather than each other. The attitude has to be one of restoring a good relationship with the most important person in one’s life, next to God. Cooportunities work great on a couch, sipping “G-rated” beverages, and giving your heart over to empathy toward your partner. You both have the most to win or lose in a cooportunity. The ultimate goal of a cooportunity is to restore Honest Intimacy. Many think intimacy is just what happens in the marriage bed, but it is far more than that. The intimacies of the eyes, mind and heart are much more important to the marriage. Focus has worked through issues that were written down and addressed. 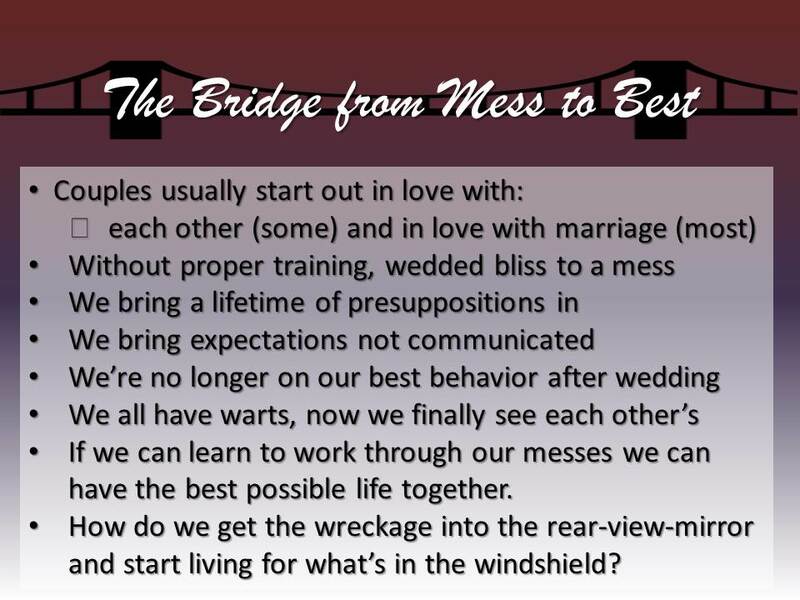 Those issues are now in the “rear-view-mirror” of the marriage vehicle, and both partners are now focused on the life of plans an opportunities happening in the windshield. As the couple goes forward, each partner looks to how they can proactively benefit the relationship, showing initiative in thoughts and deeds. Honest intimacy is the warm, close environment that long-term, loving marriages grow into. To keep a marriage focused on honest intimacy, couples should spend time together each day and each week, nurturing their relationship between each other and between the couple and God. Conscious contact with God and partner will ground each partner in their shared plans, goals and intimacy. Marriage is an institution created by God, where husband and wife compliment each other’s contribution. The contribution is 100% to 100% dedication to success, because two have become one according to God’s plan. 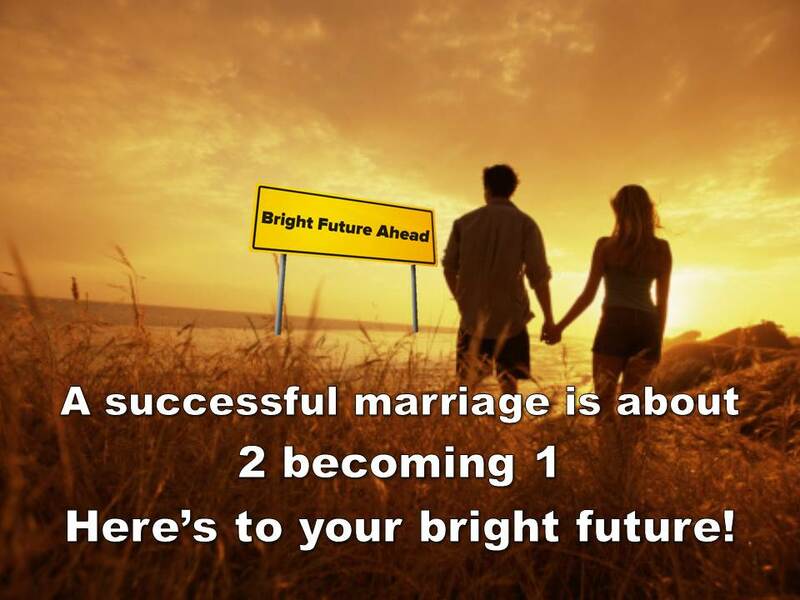 The best marriages reflect the light of the One who made them and sanctified them. Have a question about marriage? … a comment? I look forward to hearing from you in the comments section below.